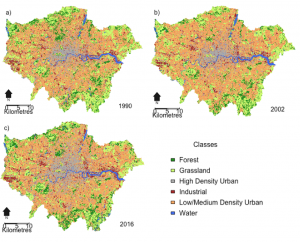 On the 2nd March at the Earth Observation and Environmental Sensing (EOES) Research Hub meeting, I presented my recent research into urban land use and land cover changes (LULCC) in London and Nairobi, with a particular focus on urban greenspace. The work had been conducted for my MSc Climate Change dissertation at King’s and motivated by the increasing awareness around the important ecosystem services greenspace provides in urban areas. These include (but are not limited to) mitigating the urban heat island (UHI) effect, improvements to local biodiversity and stormwater retention. To analyse LULCC, I classified Landsat imagery of both locations between 1988 and 2016 using a supervised classifier (Random Forest). Results for London and Nairobi are shown in Figures 1 and 2 respectively. In London, my results suggested densification and industrial development between 1990 and 2016 accompanied by an overall increase in urban areas by 4% and a corresponding decrease in vegetated areas by 4% in that same period. Figure 1. 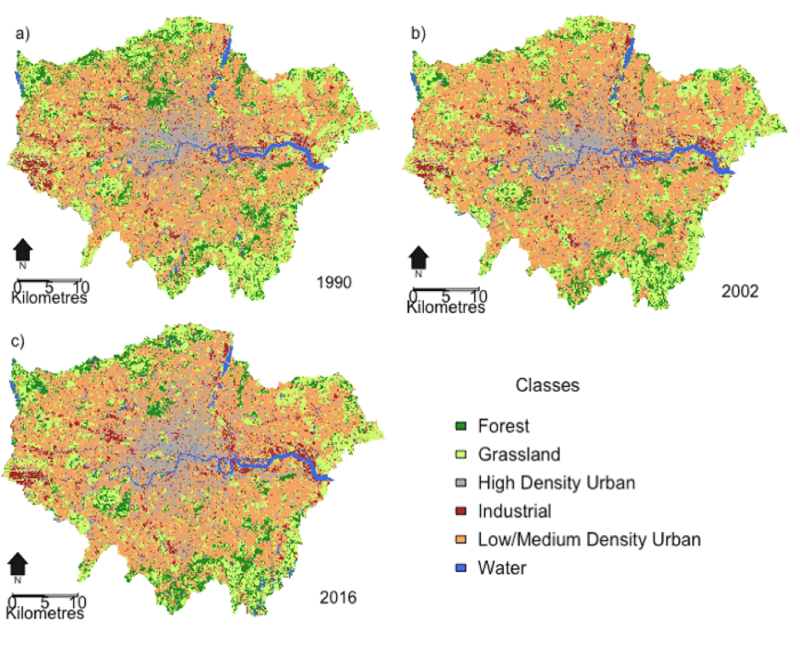 Supervised classification of London in a)1990, b) 2002 and c) 2016 using the Random Forest Classifier.